Justin Bennett will be performing with Ohgr, featuring Skinny Puppy frontman Nivek Ogre, on their headlining TricksTour in support of the new album “Tricks”. The tour includes headlining gigs at all three of this years Cold Waves Festivals in Chicago, New York, and Los Angeles. The tour will also feature special guests Lead Into Gold, with founding Ministry member Paul Barker. Justin will be performing with Ohgr, featuring Skinny Puppy frontman Nivek Ogre, on their headlining tour in support of the new album “Tricks”. 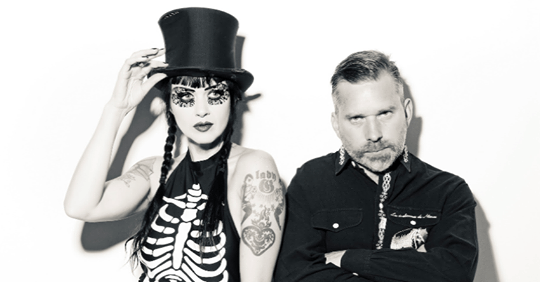 The tour includes headlining gigs at all three of this years Cold Waves Festivals in Chicago, New York, and Los Angeles. The tour will also feature special guests Lead Into Gold, featuring founding Ministry member Paul Barker. Italian industrial punk band Disciplinatha, who achieved cult status through the late 80’s and early 90’s and broke up in ’97, has reformed under the moniker “Dish-Is-Nien“. Their self-titled album, which features Justin Bennett on drums, will be released by Contempo Records on January 27th on vinyl and digital formats and can be pre-order on the official Dish-Is-Nien website. Italian industrial punk band Disciplinatha, who achieving cult status through the late 80’s and early 90’s and broke up in ’97, has reformed under the moniker “Dish-Is-Nien“. Their self-titled album, which features Justin Bennett on drums, will be released by Contempo Records on January 27th on vinyl and digital formats and can be pre-ordered on the official Dish-Is-Nien website.